Advanced Roofing Conpects will provide a free roof inspection and provide a value engineered solution with options that fit your budget. Re-roofing, re-covering, or retro-fitting a flat roof can help maintain a healthy building and your valued investment. Re-roof, recovery, and restoration systems are appropriate for roofs that can no longer be repaired through regular maintenance, are showing signs of serious deterioration, or are regularly leaking. •	Re-roofing a flat roof, or the full-elimination of the existing roof system, involves removal of the roof surface, roof membrane, and roofing insulation from the roof deck substrate. •	Roof Recovering of a flat roof entails roofers covering an existing roof system with a new roof membrane. This process requires inspection of the existing roof membrane / substrate and verification of weight requirements prior to the new roof membrane being installed. 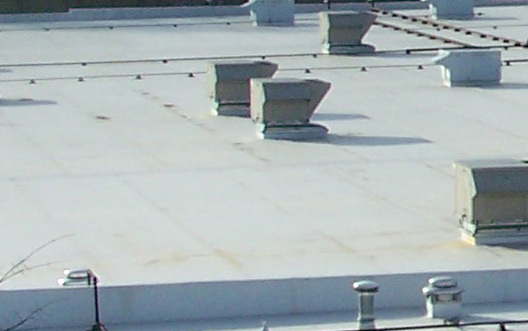 •	Restoring a flat roof involves installing liquid applied reinforced membranes to the existing roofing system. Certain conditions must exist for a roof to qualify to be restored. Conditions such as attachment, surfacing, and age are all taken in consideration before a retro-fit is recommended. Re-roofing requires great attention to detail. In most cases, the building we are working on will be occupied while we are working. We take special care to make sure the building tenants and pedestrian traffic are safe and are inconvenienced as little as possible when we are installing your new roof system. As with all roof installation projects, we strive to exceed industry standards for safety and quality. Our roofers work under strict protocols to ensure safety and quality expectations are exceeded. Your roof system is a serious investment, and proper application, when re-roofing, re-covering, or restoring a flat roof system, will extend the life of your roof for years to come.